Ticket sales are key to the success of any mass transit authority, and robust, reliable and intuitive ticket machines are central to this success. Transway’s suite of ticketing machines includes the full gamut of ticket sales devices, including ticket vending machines, ticket dispensing machines and ticket kiosks. Customer operated, personnel operated, driver operated and remote fulfillment solutions are available in the Transway product portfolio in order to provide the full range of cash and cashless payment solutions to the passengers. Transway develops intuitive user interfaces that incorporate both touch screen and keypads. The ticket vending machines are robust and tough for use in different weather conditions, including long hours of exposure to the sun, so that your investment is long-term and lasting. The traveler’s user experience is a seamless one, as they can choose from various payment options. 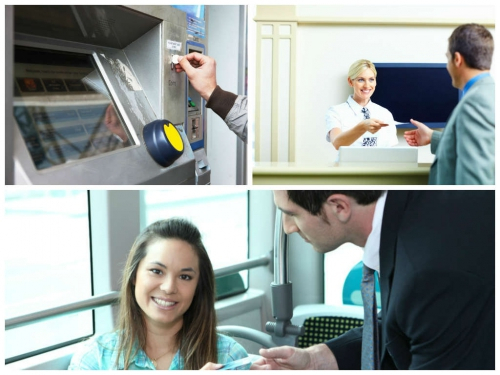 As a transit company, you can chose which ticket dispensing machines make the most sense for your customer base. All of the Transway ticketing machines are capable of managing multiple tariffs. Furthermore, the Transway electronic ticketing systems are capable of bidirectional communications through various forms of wireless and cellular technologies. Transway uses the open and ubiquitous Android operating system, with all of its inherent advantages. Transway’s ticketing machines are easy to use and provide accurate and real-time information to the cashier station for your benefit!